Deferring action on any prospect in search results by clicking 'snooze'. Snoozing is good for deferring action on a candidate match. Perhaps they've recently changed jobs and it's too soon to reach out. Or maybe the candidate has messaged back saying, "happy where I am but let's check in again in x months." Whenever you snooze a candidate for a period of time, you'll receive an email reminder to reach out again after they "wake up." Choose the duration of deferment, for example 1 week, 1 month, 3 months (or a custom time). 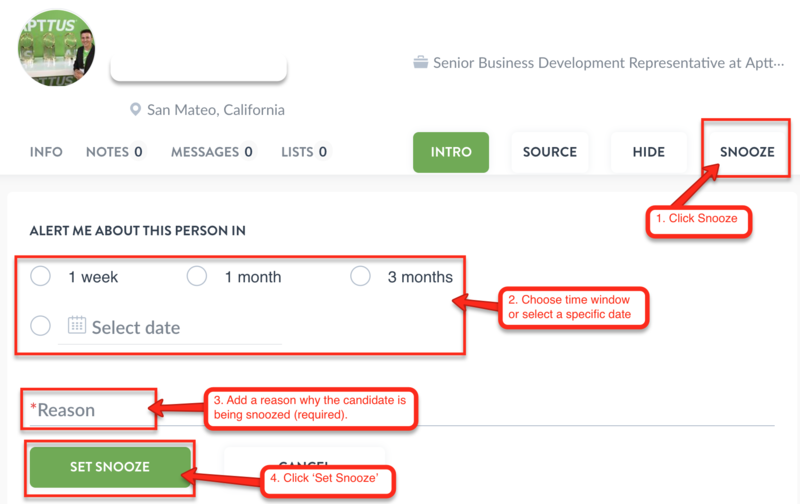 Three days before the expiration of the snooze, you will receive an alert email to determine next steps for the candidate. You can also remove the snooze at any time by clicking 'unsnooze' on a candidate. Tip: Snoozing is also a great way to help manage referral bonus payout for your employees. Snooze the referred candidates for the time that matches your payout criteria (e.g. 6 months of employment), and Teamable will notify you three days before so you can submit the referral bonus for the employee who referred the candidate.